With dozens of companies and teams now preparing private missions to the Moon in order to claim the Google Lunar X PRIZE, a question I get asked from time to time is: what about the space junk? Or, from those a little more familiar with space flight: what about planetary protection? The concept behind planetary protection is a simple one. As humans begin to reach out and explore what are literally alien worlds—-whether that be with robotic spacecraft or with human astronauts—-we must keep in mind that our very presence has the potential to alter what we find there. This can be true on an ethical level certainly (the extraterrestrial equivalent of the Sierra Club mentality), but it’s also undeniably true on a scientific level. Extremely sensitive experiments carried aboard each space craft intended to search for trace chemicals or other minute indications of something scientifically interesting would be rendered invalid if we had cause to suspect their signals were being corrupted by things brought along with the spacecraft itself. Indeed, we need not only to protect not only each spacecraft’s instruments from unwelcome fellow passengers on that spacecraft—we also need to protect each spacecraft from the effects of all of the other spacecraft that have visited that place. Planetary protection requirements for the Moon are not strict, and impose no operational constraints at all. The international consensus guidelines maintained by the Committee on Space Research (COSPAR) specify that a limited set of documentation should be generated, including a pre-launch report saying what is planned and post-launch and end-of-mission reports that describe what actually happened. 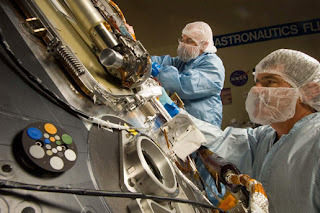 The reports should include a list of the organic materials carried by the spacecraft at more than 1 kilogram per type, as well as a record where the mission went and what hardware was left behind, including final disposition of the spacecraft. These reports are normally submitted by a mission to the Planetary Protection Officer of the launching national agency, who gives them to COSPAR, which reports to the UN. It hasn't been quite worked out what to do in the case of commercial planetary missions, since there haven't been any yet – that’s one of the things about which I'd be happy to hear suggestions. With the requirements for the Moon being essentially limited to reporting, I’d certainly expect that all of our Google Lunar X PRIZE teams would comply. At this point, compliance with these codes are not specifically mentioned in the prize Guidelines--however, that has more to do with an organizational philosophy of not wanting to add requirements that teams already impose upon themselves. After all, the teams will each have an extremely strong market-based incentive to fully comply with the planetary protection guidelines issued by COSPAR or to develop their own equivalent or superior guidelines (in addition to the obvious ethical incentive); I can’t imagine too many investors or sponsors will want to participate in a mission that hasn’t done its homework on this issue. I asked Dr. Conley what would be her ideal scenario for the Google Lunar X PRIZE with regards to planetary protection. It would be great if the Google Lunar X PRIZE Teams would agree to follow the same policy that national space agencies do, which is to require that their missions all follow the international COSPAR guidelines on planetary protection. Other non-agency groups are already doing this—for example, the Planetary Society has already announced that they will follow COSPAR guidelines for the capsule that they're contributing to the Russian Phobos-Grunt mission to Mars. If the teams do pledge to follow the COSPAR policy, this would go a long way towards establishing a precedent for the policy—which, by the way, everybody is welcome to help develop—in commercial space exploration. Basically, it's 'good citizenship' for the Solar System. Good citizenship for our solar system—-sounds like a good idea to me! Note: You can find more from Dr. Conley here.